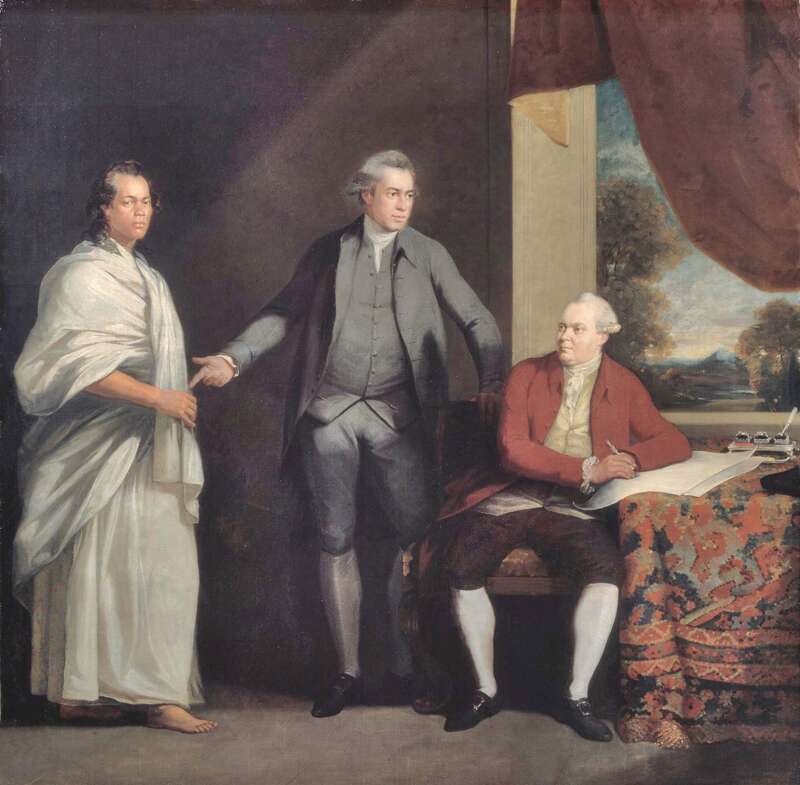 An Oil Painting in Gilt Frame – Omai, Sir Joseph Banks & Dr. Solander, by W. Parry R.A. 5ft x 5ft. 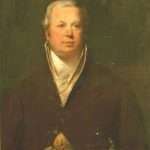 A Portrait in oils in Gilt Frame, 3ft x 2ft 3 inches – Sir Robert Vaughan, 2nd Bart. 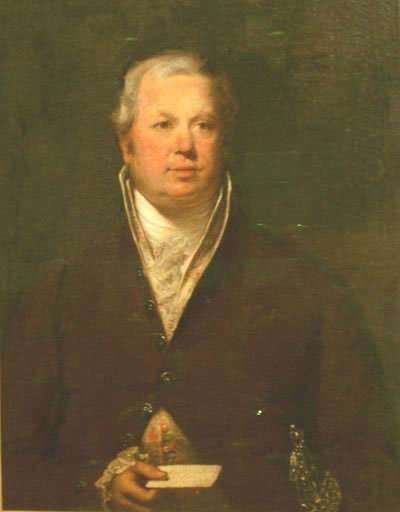 A Portrait in oils in Gilt Frame, J. Vaughan Esq., 7ft 6inches x 4ft 8 inches. An old Oak Chest with carved front 3ft 9 inches. 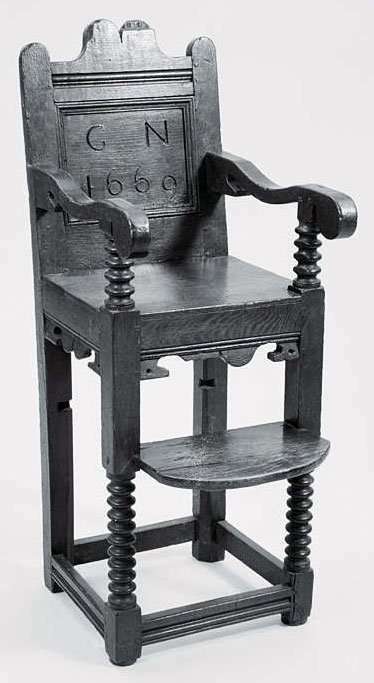 A Child’s high back chair in old oak, back panel carved G.N. 1669. 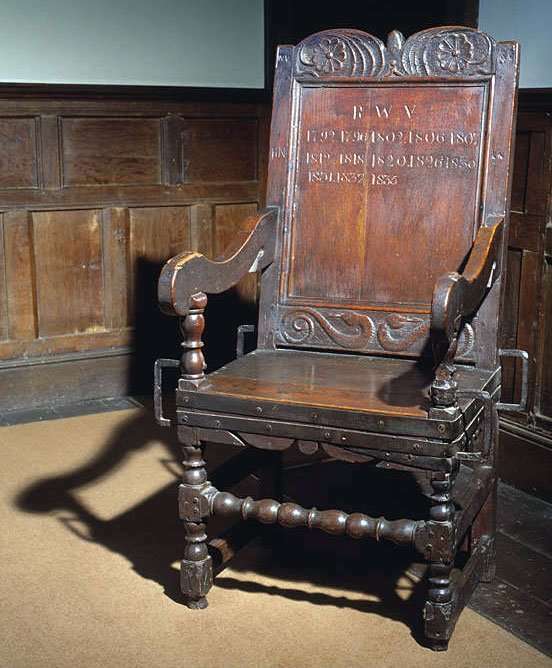 An old Oak Arm Chair with carved back, the centre panel carved R.W.V. 1792, 1796, 1802, 1806, 1807, 1812, 1818, 1820, 1826, 1830, 1831, 1832, 1835. 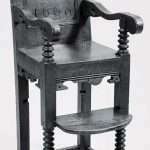 Fitted with four iron pole brackets. 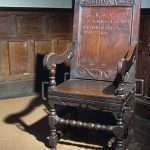 An old Oak Refectory Table on a carved frame, four supports and a centre stretcher, 5ft 8 inches x 3ft. A polished Inlaid Oak Floor. A Parchment Deed of Baronetage granted to R.H. Vaughan Esq. with seal in leather case. A bordered Indian Carpet with fringed edge, 22ft x 15feet 6 inches. 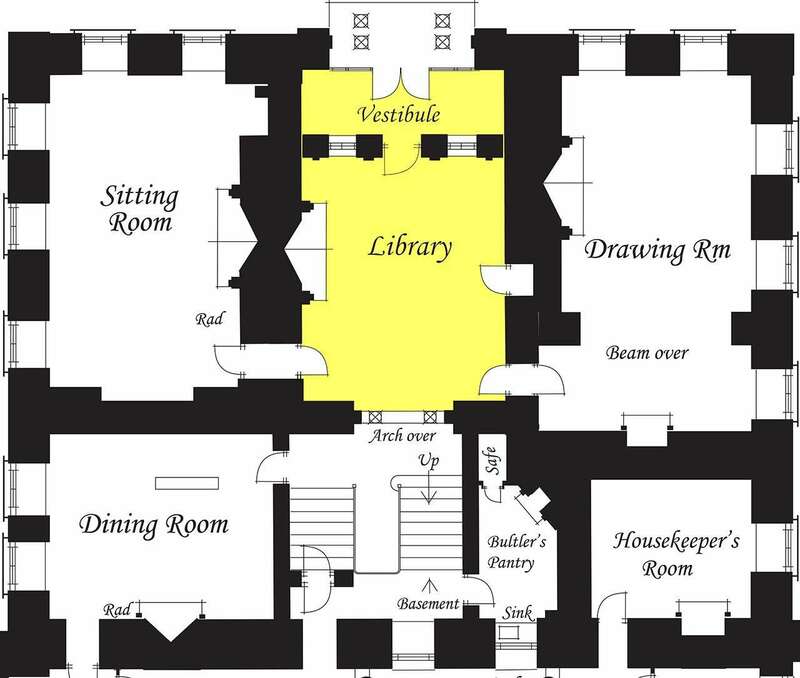 A row of open book selves and ledge in mahogany with three carved cornice brackets and leather edging, 22ft 7 inches. Two inlaid mahogany bookcase enclosed by four folding doors with wire mesh, the lower part fitted four cupboards enclosed by folding panel doors all fitted with locks and keys, 9ft 6inches x 9ft 10 inches. 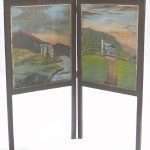 A stained gun case lined with green baize and enclosed by a pair of folding glazed panel doors with lock and key, 4ft x 3ft. A mahogany medal case fitted with two plate glass shelves, a mirror back, glazed sides enclosed by a pair of sliding glazed doors, 19 inches x 12 inches. A telephone instrument, two ditto directories and a cover. A carved oak octagonal table on four supports with stretcher rails, 1ft 10 inches. 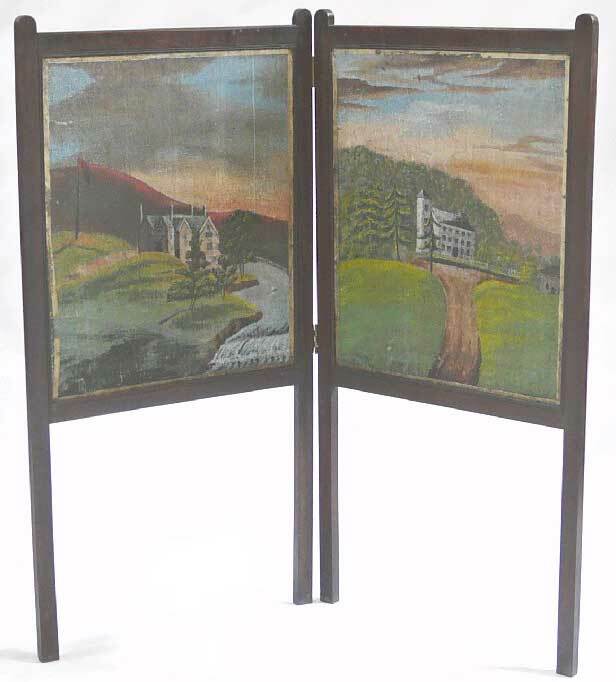 A mahogany folding fire screen with painted canvas panels. A carved walnut writing table on two supports fitted four drawers with locks and an inset leather top, 4ft x 3ft. A brass letter scale and three weights. A wood letter box lettered Major J. Vaughan. An old chest with worn skin cover with nail inscription E.W.R.Y. G.R. 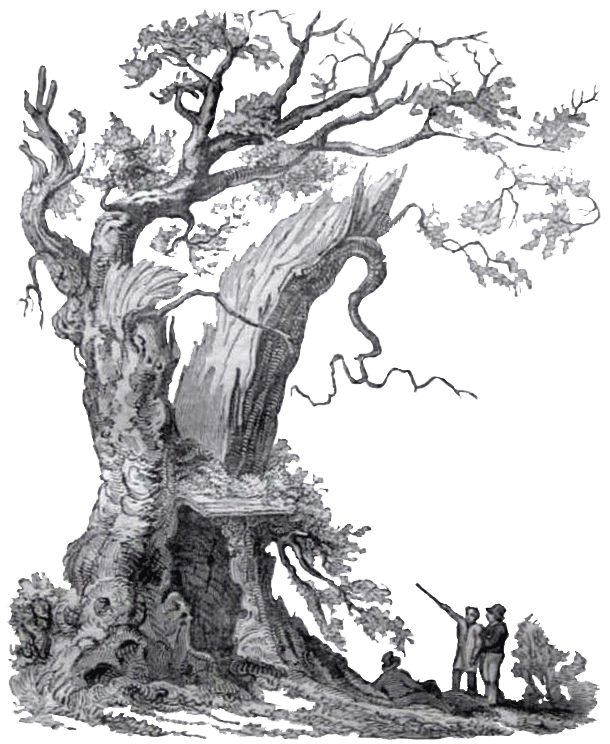 1802, 3ft 2 inches x 1ft 5 inches.